Last week I experienced a near death experience. Ok, not really. But it felt like it. I posted something vulnerable on Facebook. “How can you compare a Facebook post to a near death experience,” you ask? Simple. When the body senses danger, you have three responses: You fight, flight (leave your body), or freeze. I’ve been frozen for a while on my personal Facebook page. 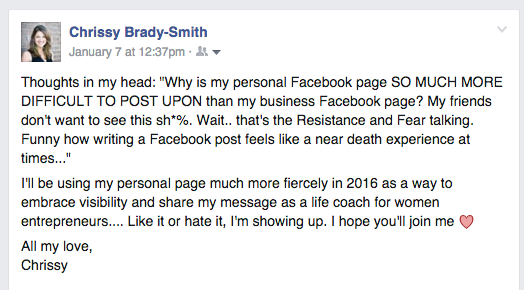 My mind has been telling me that it isn’t safe to share my coaching business on that platform because I’ll be judged or disliked by my friends and family. That story was 5 years old. Something happened in the first grade that caused me to believe that if I shared myself vulnerably with others, I’ll get hurt. The fear of a 5 year old girl was running the show. When you diagnose your limited belief, the prescription is to write a new and empowered story that matches your power in the present moment. When I share myself vulnerably with others, I give permission for others to do the same. My vulnerability becomes a contribution. Reasoning your way out of it. When resistance is present, your scared mind comes up with every “reason” you shouldn’t do what you want to do. When that happens. Do the opposite. Go for it. Dive in. For me, the opposite action was pressing, “Post”! A leader shows up, even in the face of resistance or fear. You’re one of those leaders, << Test First Name >>, one of the greats. 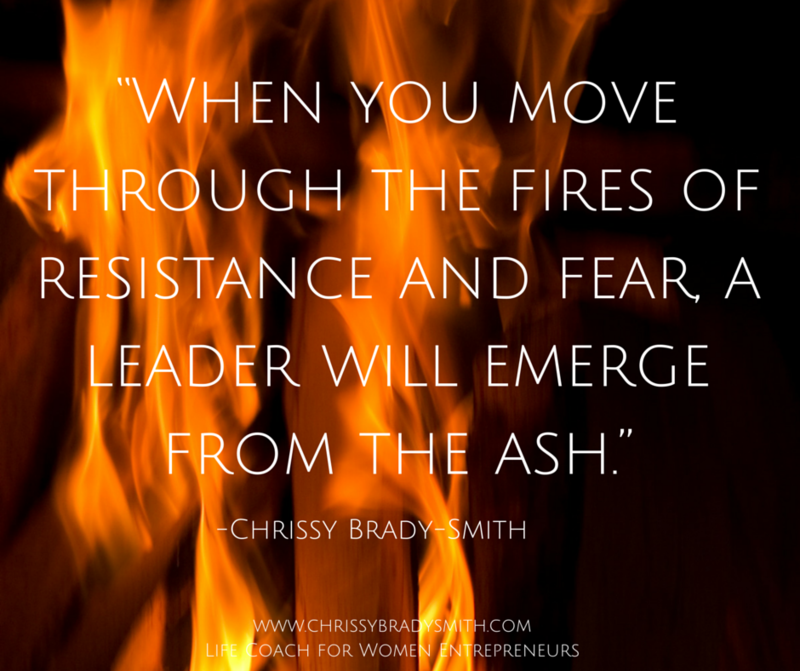 If you’re feeling defeated now by the sneaky feelings of fear or resistance, that’s a GOOD THING! That means you’re up to something big, beautiful and real. That’s why I want to invite you to have a personal coaching call with me. If you’re ready to move through these fires once and for all, I’m now opening up my calendar free FREE hour long coaching calls with potential clients. Free session? Yes. I don’t believe in Discovery calls anymore. The most authentic way to discover if a coach is right for you is to work with her first hand, that’s why I want to work with you in real time on an issue that’s keeping your business and life small. This confidential call will be an hour long, a priceless opportunity to transform an issue that’s keeping you up at night so your life and business can finally meet as one. P.S. I’m a life coach for women entrepreneurs who desire to breathe more soul into their businesses so they don’t burn out and reach an upper limit of success and happiness. My mission is to support your entire human experience throughout the entrepreneurial journey so you can be the the light worker you were born to be with a brand that expresses your essence and true nature.